The 17" strand closes with a beautifully cast sterling silver toggle clasp. 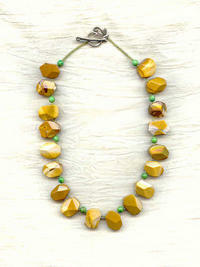 The large stone beads are a substantial weight, so the necklace is NOT lightweight. It is, however, quite eye-catching, and an excellent price; just what you'd expect from SPARKLE PLENTY. Handsomely patterned silver leaf jasper and sparkling copper-lined crystal cathedral beads make a warm and inviting combination.